The Government of Japan has provided grant assistance worth more than 2.3 billion kip (US$274,459) to support a project dedicated to the empowerment of disabled people in Huaphan province. Large numbers of children remain malnourished in Laos, especially in poorer rural parts of the country, despite efforts by the U.N. World Food Programme and other concerned organizations to provide better food, sources in Laos say. The cabinet has instructed Vientiane authorities to speed up zoning for the development of different areas of the capital so that management of the country’s urban heart can be better regulated. The United Nations Special Rapporteur on extreme poverty and human rights, Philip Alston, will conduct an official country visit to the Lao People’s Democratic Republic from 18 to 28 March 2019 at the invitation of the government. 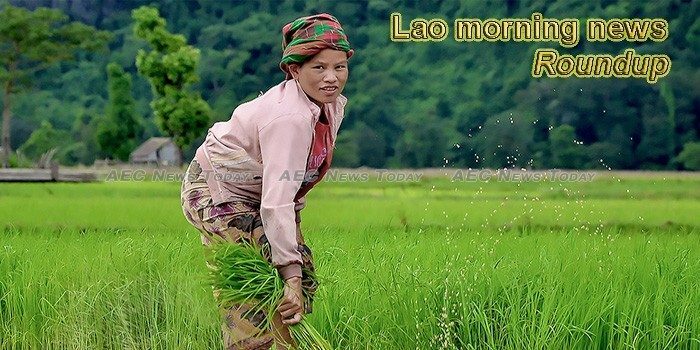 Laos and France have agreed to continue their shared work to develop rural infrastructure under the project ‘Agricultural development support in the mountainous districts of Oudomxay province, Laos’. Laos’ first ever Real Estate Expo has kicked off in the capital Vientiane from March 1-2 at Don Chan Palace Hotel in Vientiane. More than 1,000 people turned up to have free tests for vision problems and cataracts at the International Cooperation and Training Centre in Vientiane on Friday, as one of many activities taking place to mark International Women’s Day this week. The Department for Agricultural Land Management, Ministry of Agriculture and Forestry, is continuing to roll out its guideline on Participatory Agricultural Land Management (PALM).